Ian Adams is a second year M.S. student specializing in Environmental Social Sciences through the OSU Environment and Natural Resources Graduate Program. He holds a B.S. in Marketing from The Ohio State University, where he minored in Society and Environmental Issues. Broadly, he is interested in how emotions and self-identities influence engagement in pro-environmental behaviors. During his undergraduate career, Ian worked with the aluminum engineering company, Arconic, to create pro-environmental messages regarding the use of aluminum in automotive manufacturing. 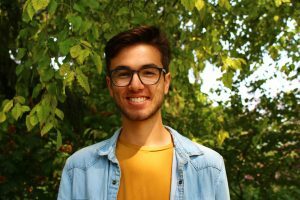 In the School of Environment and Natural Resources, Ian is a student representative to the department’s Graduate Studies Committee and reviews funding applications for the MiniGrants program. Outside of academia, Ian enjoys crocheting, baking new recipes, rewatching Parks and Rec, and poorly playing tennis.